As I sit here at my computer to start writing, I’m not even sure how I’m going to say what it is I want to say. Actually, I’m not even sure exactly what it is I want to say, so if you’re not in the mood for a rambling kind of post, then feel free to click away to something else. Recently, I’d say in the last couple of months or so, certainly since the end of the summer, I’ve had rather a lot to take on board emotionally and on a personal level, the details of which are probably best suited to a separate blog post. But since receiving a certain piece of news late-August, I feel there’s been an imperceptible and subconscious shift change in the way I approach things. I wasn’t even aware that this was happening until just yesterday and this morning, but with hindsight, the signs were all there, I was just oblivious to them. I guess things came to a head a couple of days before we were going to Paris for our wedding anniversary last weekend. If you follow me on snapchat, you’ll already be fully up to speed and aware of it, and in fact, so many of my lovely snapchat followers sent some very valuable and useful advice along with really supportive and heart-warming messages. Basically, I suffered what I now know to be an anxiety attack. I’d never knowingly suffered from anxiety before – sure, I’ve felt overly nervous and anxious about stuff, as have all have, I’m sure, but never to this extent. It felt like it came out of nowhere, but taking a long, calm look at it, it was more likely a build up over time of stress, commitments, demands being made on and of me, feeling out of control and feeling helpless in the face of everything that was ahead of me. How did I feel? Just totally out of control, yet strangely, very much in control at the same time. Physically, I was very jittery, it felt like my heart was in my throat, I couldn’t eat anything at all, all day, and I couldn’t sit still for a second. Emotionally and mentally, I couldn’t focus on anything in particular, yet for some reason I decided that this would be the perfect time to empty out my wardrobes and clear everything out – currently half the contents of my wardrobe are still sitting on the floor of my dressing room, waiting for me to complete the task I started and then ran out of steam to finish. The second day, I felt dizzy and nauseous – I’ve since been told by many that this is perfectly normal as the anxiety feelings begin to subside. This is not meant to be a pity party in any way at all. I know, when I’m being objective, that I’m a very lucky girl (MA) and have so much, in fact, everything to be thankful for. Which is why it took me even more by surprise – if you were to ask anyone I know, I would be the very last person they would think would suffer from any sort of anxiety attack. Although, having said that, a friend this morning who was shocked for that very reason then went on to say, that actually, given my personality, I had all the traits that fitted in with suffering from anxiety attacks… so it just goes to show, you never know what people are going through just by their outward demeanour, behaviour and appearance. I don’t profess to be any sort of expert about anxiety attacks, their effects and how to deal with it. If you’re suffering from anxiety, or think that you might be, there are many different websites to turn to for advice – what did we do before google search entered our lives? I hope this won’t happen to me again, but what I can tell you is how I dealt with what I hope will be my only anxiety attack, in the hope that even if it helps just one person out there, it might do some good. Mindfullness – when your breath is out of control and you can’t seem to centre yourself, being mindful of the place and moment you’re in really helps. I discovered a great meditation app, courtesy of one my snapchat followers that really helped in the short term, and hopefully will help long term too. It’s called Calm and is a great introduction for first timers, with short, guided meditations. Breathing – if you can’t get your head around guided meditations, then focussing on your breathing can really help to centre you and calm you down. Really focus on the inward and outward breath and think of nothing else. It’s just another form of meditation, if truth be told. Sure, your mind is bound to wander off – Did you turn the iron off? What to have for dinner tomorrow? When is he/she going to call you back? and so on and so on. That’s perfectly normal. It’s nothing to stress about. You slowly bring your focus back to your breathing and keep going. It may be that you decide to turn to yoga – that’s certainly something I intend to do. Surround yourself with joy – while that might sounds a little too new age for you, it’s what I’ve tried to do since last week. I guess clearing out the wardrobe is a sign. I need to get rid of all the accumulated stuff in my life that doesn’t bring me joy – clothes I no longer wear, books I’ve read but haven’t passed on to new owners, extraneous junk around the house I don’t need. And yes, this includes people too. I know this sounds harsh, but I’ve got to an age where I just don’t have the time or energy (and currently, the emotional strength) to deal with other people’s pettiness. So if you’re not bringing joy into my life or if I feel I’m not bringing joy into yours, what’s the point? Life is short. As we get older, I feel the time passes faster and faster. I intend to fill my waking days with good souls and hope that I can bring as much happiness into their lives as they do into mine. Me-Time – Let’s face it, we’re all busy. As you probably know, I’m a mother of three children, (all growing up way too fast), so I find I’m constantly rushing around, dividing my time between being mum to them (and my two darling cats), wife to my husband, daughter to my mother, daughter-in-law in my mother-in-law, sister to my sister, socialising with and being an agony aunt to all my friends, not to mention running my blog, YouTube channel, writing for other publications… it’s no wonder that finding time to look after me has taken a back seat. Either I don’t have the time, or when I do, I feel guilty. Being “mindful” has helped me to realise I owe it not just to myself, but also to all the other people who depend on me (see that long list above). If I’m not in good shape, physically, mentally and emotionally, then how can I be all the things I need to be for all of them? 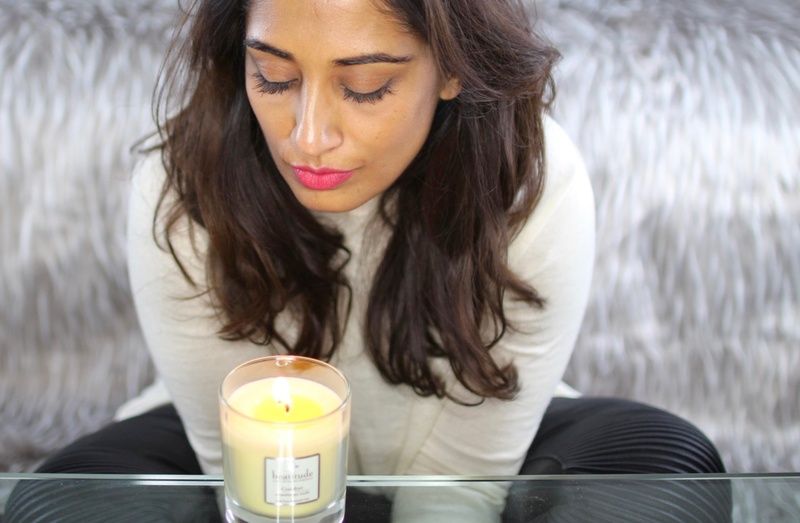 Pamper time – As a vital element of that of me-time, I’ve been looking to see which products can help me to be more mindful, and these are the ones I’ve been turning to so far. Smells and scents are an easy way to mentally take yourself into a different place, so a good candle is one of the first things I turn to. 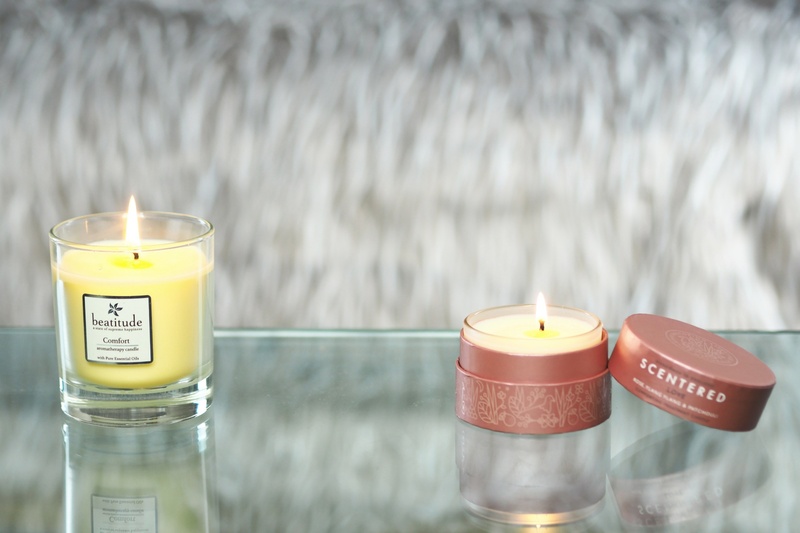 Beatitude’s Comfort Candle and Scentered’s Love Therapy Candle have been on daily rotation; their soothing, warming scents calming me down on the first whiff. This Works just gets their products right, always managing to tap into the zeitgeist of what we need. So their Stress Less range couldn’t come at a better time for me, especially the Stress Less Rollerball and the Stress Less Hair Spray. Both are portable enough to fit into a handbag so I can always have them with me and use them whenever I feel I just need to step back a bit and steal a bit of me-time. 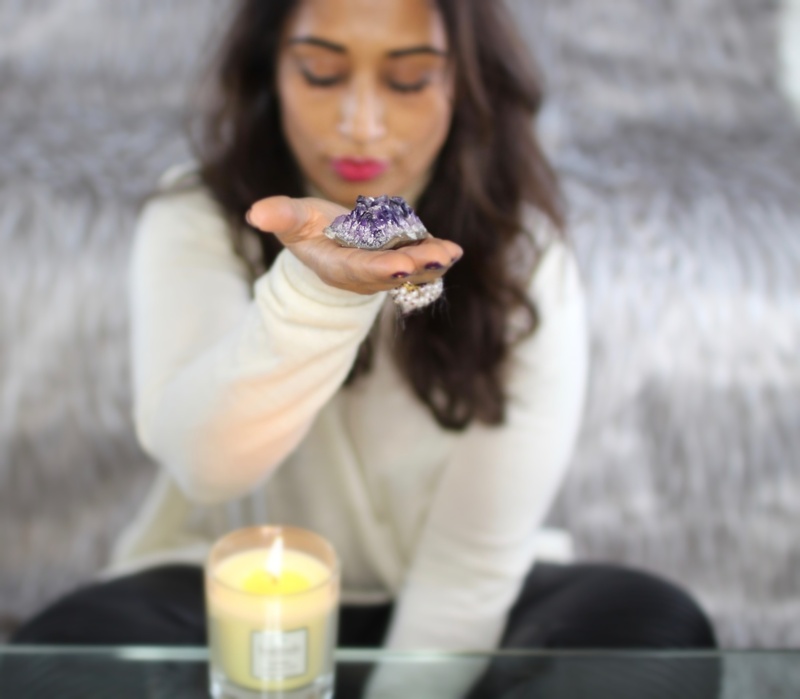 Deeply inhaling my hair or my wrist just helps me to slow down, calm and re-centre myself. 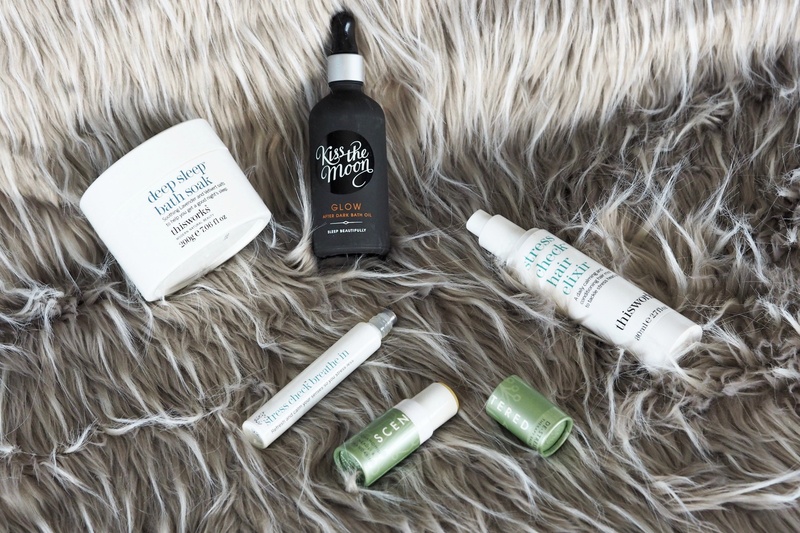 Waking up after a rubbish night’s sleep is a sure fire way to have a rubbish day, so I’m loving adding some sleep-well products to my night-time routine. I’m not normally a bath person (I never have make the time), but recently, with the long nights drawing in, I’ve really been enjoying the Glow After Dark Bath Oil from Kiss The Moon (isn’t that the loveliest name for a brand?) and the restful Deep Sleep Bath Soak Salts from This Works – both have been helping me drift off to a restful and refreshing sleep. And of course, taking a daily “mind-nap” has now become a staple part of my day in which I step back from the madness of the day with a short meditation. I use the Calm app I mentioned above, and if I remember, I’ll hold my beautiful amethyst crystal for its purported healing benefits. (It’s known for its healing powers to help with physical ailments of the nervous system, emotional issues and energy healing). If you’ve suffered from anxiety, I’d really welcome your comments on how you’ve dealt with it and what you’ve found helpful. Thanks so much for “listening” – I know this is not the usual kind of post you see here on my blog, but I think it’s just as important to talk about this as it is to talk about the newest lipstick. Self-care is SO important! It’s highly underrated by men and women alike but it is literally a life saver. I think, and speaking from my own experience, one of the reasons it’s difficult to identify the signs of an impending anxiety attack is because of the way it is usually portrayed in popular culture. For most people, that’s our only avenue of information on the subject unless you personally know someone who has suffered an anxiety attack AND talks about it. But so often we assume that an anxiety attack is some sort of frantic bout of yelling and dramatic acting when most of the time it’s extremely subtle. It just builds up and then the dam breaks and all of a sudden you feel like you’re just…drifting. Unmoored. I’m glad to hear you have a handle on it and understand your personal signs regarding anxiety. It’s different for everyone but knowing what may trigger or push you towards an attack is more than half of the battle. Thank you Nieves – I’m so glad you left your comment here. You’re right, anxiety can manifest itself in so many different ways, not just the stereotypical way portrayed in the media. It creeps up on you when you’re not expecting it at all, and takes you by surprise. Thank you, Ambarina! I’m doing pretty well. Oddly enough, the holidays are calming for me.